“Sori” in SORI: Voice from the Heart is the name of a robot fallen suddenly from the sky. Kim Hae-kwan comes across the robot and names it Sori (meaning "sound" in Korean) because it can hear every sound from all over the world. He begins tracking down his daughter who has gone missing for ten years, following the robot’s messages. SORI: Voice from the Heart is a sci-fi human drama, portraying communication with a special being and their journey. Director LEE Ho-jae presented new achievement of local genre films in his debut The Scam (2009), and is going one step forward through this film. Robot is an unusual subject in Korean Cinema. How did you make such a film? I read the script written by LEE So-young years ago. I was attracted by a story that one with sad memories meets another with similar memories and that they are consoled. So I thought the script is close to drama rather than sci-fi although robot is in it. I approached it just as an unusual movie that has a disparate figure in realistic background. Nevertheless, you might have pressure to express the robot’s character, because the robot is a main character. It is very important for sci-fi movies to have reality about non-existent figures. So I tried to style the robot and the situation as familiar as possible. It took me a year only to fix the robot’s concept. The first thing that I gave up was the robot’s walking function. Practical condition did not allow it. Sori is a kind of satellite. I don’t think a humanoid robot is appropriate for the film. Also, I made a rule never to use CG for the robot, and instead made a life-sized model. There were less and less things that we could do. In some ways, Sori is a robot that is able to move only its head. However, it looked more plausible. I got inspiration from a CCTV in a building. Sori is an upside-down CCTV that has lenses. We produced total three robots: Unit 1 has no motion functions for stunt; Unit 2 has all functions; while Unit 3 is made of polystyrene. Unit 3 was made for monitoring on screen and was light enough for the actor to carry it around. 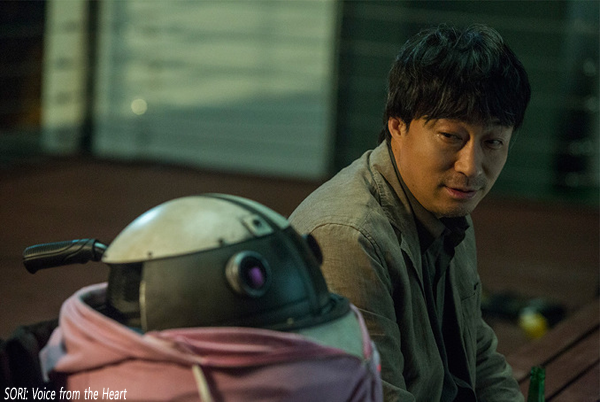 The film shows the process that robot and Kim Hae-kwan meet and interact. How did you intend to depict a relationship of them? I thought an ordinary middle-aged man needs enough time to embrace the robot like a man and hang out with it. So I unfolded the process of changing Kim Hae-kwan’s suspicion into trust on Sori, at the intro of the film. It may be slower than usual movies’ pace of today. However, their relationship, which is like that of a father and a daughter, would be unconvincing unless the film suggests the progress. Also, I did not want to make their characters too dark. I thought there needs to be some humorous parts in describing a father-daughter relationship, even though its subject is serious. The film gains probability to the robot’s character and the story, due to Kim hae-kwan’s paternal love. Likewise, actor LEE Sung-min’s performance contributed much in the film. LEE Sung-min was implicit not only in his character but also in the entire movie. It is not easy to perform emotionally with an object, but I trusted his performance from the beginning. He set up the most ideas of his character from the script. So I just left things up to him without particular directions. SORI: Voice from the Heart contains a variety of genres; it is a sci-fi movie, a road movie, and also a chasing movie. A trend of commercial films recently is like gift sets, so I intended to add various zests. I like genre movies in person. However, I didn’t mean to mix diverse genres deliberately from the beginning, the movie was naturally directed like this way while I was following the emotions in it. I am not the first one to try mixing genres in a film either. It is often seen in commercial films. Road movie is a prominent genre among them. This movie was filmed all over the country. There are about 100 scenes in this film, and more than 80 locations were selected during pre-production process. We incessantly moved from one location to another during our shoots. We rarely went to the same place to shoot twice. Like your previous film, The Scam, Korean modern history is widely seen in the movie. SORI: Voice from the Heart is based on the Daegu metro fire in 2003 and National Intelligence Service wiretapping civilians, a recent controversial scandal. When developing stories, it faces up to the reality. Thousands of things that no one would imagine to see in a movie do happen in real life. Therefore, it is hard to add reality to movies without mentioning real incidents. I added the Daegu metro fire later during dramatization. I was anxious to direct it because the wound is not gone but still there. However, I wanted to say that we haven’t forgotten it. The film is based on a tragic incident, and has some scenes that purposely make audiences cry. However, it seems like a natural emotional explosion rather than a tear jerker. It depends on audience tendency. Some people might see the film as a tear jerker, while others may reckon that it does not have enough sensitivity. Personally, I consider SORI: Voice from the Heart as an emotional human drama.